Irvine condos are showing the same price weakness as homes in other areas. If Irvine is different and immune to price declines, why aren't it's condos behaving differently as well? Many people are hunting for houses. Some are looking at the high end, and some are lookiing low. Which is the better way to go? OC Housewife, Ponzi borrower, failed land baron. This week Jaysen has taken on a comparison of the single family market with the condo market in Irvine to see the similarities and differences. Some of the conclusions may be surprising. Below is Jaysen's writing. My comments pick up afterward. Today continues our series on using the Global Decision Hedonic Price Model to determine how homes values are trending and the underlying factors that create such value. Up to this point, we’ve focused on single-family homes (SFRs). In some parts of the country, SFRs represent the vast majority of the market. Irvine is not one of them. In fact, in the Irvine sales data from 2000-2011Q2, condos represent over 50% of all sales by quantity. As a result, no understanding of the Irvine market is complete without an equally in-depth review of how condos sales are trending. In expensive coastal California, condos serve as an entry-level market for those moving from rentership to ownership. More importantly, condos *had* served as a source of equity for those wishing to move up the ownership ladder – into a single-family home. In the above chart, we compare Irvine SFRs to Irvine condos over the last 11 years. Not surprisingly, the lower-cost condos rose a bit higher (as a percentage of their Year-2000 starting point) than houses. Said condos have also fallen farther from their peak. Because Irvine condo values rose at a faster rate than the values of Irvine single family homes while the housing bubble was inflating, the above chart’s ratio of home-to-condo values initially shows a “negative premium” for single family residences. However, as the bubble deflates the home-to-condo value ratio quickly reverts to 1:1 and then rises further as condo prices decline more rapidly than SFR prices. An interesting chart results when we start the x-axis from peak pricing (2006) for both homes and condos. Both series peaked in 2006 and have declined 18% (SFRs) and 30% (condos) in the last 5 years. The magnitude of the decline is important to understand because it directly impacts the probability that a given homeowner is underwater. At this point, a sizable percentage of 2006 Irvine condo buyers are likely underwater. Those who purchased in 2006 are especially likely to be underwater as a down payment of 30% would have been required to keep that cohort in a positive equity position after an assumed 5% “get out” cost. Irvine condo buyers who carefully saved a 20% down payment to buy a condo in 2006 (or even 2007) now find themselves with a paper loss of 100% of invested equity. At peak median condo prices of around $580,000, such buyers have paper losses of $116,000. Such losses do not have to be realized until a sale and some owners may not find the loss of said amounts to be particularly problematic. However, the losses do have a few serious impacts in the market. First, 2006-2007 condo buyers have no equity to fuel the purchase of more-costly SFRs. This fact is reflected in the data showing that higher-end homes in Orange County take much longer to sell than lower-end homes. Second, once buyers are underwater, each additional drop in home values makes them more likely to consider walking away from the debt. Page 30 of the linked .pdf file, shows that a shortfall of $100k induces 2.5X the propensity to strategically default vs a shortfall of $50k. Page 49 shows that knowing someone who strategically defaulted also increases reported propensity to strategically default. For a full read on attitudes regarding strategic default, please see the March 2011 paper at the University of Chicago’s Booth School of Business linked above. Somewhat perversely, the 2006-2007 Irvine condo buyer who put down the bare minimum (0-3%) has a much smaller paper loss and has preserved the option of “walking away” with a smaller financial hit. Using a zero-down program to purchase a home is essentially obtaining a free call option: if home values rise, you pocket the gain. If home values fall, you have the option of walking away from the debt (in exchange for a lowered credit rating). Low-down payment programs thus create a feedback loop that exacerbates swings in the direction of the housing market. When home values are rising, they induce people to over-invest in residential real estate. When home values are falling, they exacerbate the drop by adding to inventory (shadow and real) and sap buyer demand for move-up housing. It’s hard to argue that low down payment programs make sense from a stability standpoint. With the Irvine condo dataset, we find that a large chunk (21%) of all condo sales occur in the Irvine village of Woodbridge. As a result, we can also construct a valid hedonic price index for Woodbridge Condos. Doing so allows us to not only see trends in an established high-quality area (see our previous analysis of Irvine neighborhood values to see why “high-quality” is not our opinion, but based on market valuations), but also allows us to remove the “area” as a variable in the underlying regression. In the chart above, you can see that the value trend for Woodbridge condos (light blue) and the value trend for Irvine condos (light green) are similar. Such results provide evidence that having an “area” variable in our underlying Irvine condo model is not skewing price trends and serve as a good gut check for each other. Looking again at the post-bubble behavior of price trends in Irvine, Coto, and the region (as proxied by the Case-Shiller LAOC high tier index), we find that most indexes have fallen between 29% and 33% in value. Irvine’s condos (in both Woodbridge and city-wide) have dropped 30-31% in value while the LAOC Case Shiller High-Tier is also down just under 30%. Coto SFRs have slightly underperformed with a drop of 33%. Interestingly, Irvine SFRs have declined only about 18% from peak pricing. Even more interesting, it appears that temporary incentives (such as an $8,000 tax credit) lifted Irvine SFR prices more, as compared to a 2009-Q1 floor, than condo prices. Irvine SFRs have retained some of their gains since the 2009-Q1 recent bottom, while Irvine condos have now reached new post-bubble lows. Logic would have dictated an opposite result – a fixed $8,000 “incentive” should have more greatly swayed lower-priced markets. A common theme in housing analysis is the (in)famous substitution effect. We’ve discussed this effect when looking at Coto vs. Irvine, and now we can consider the Irvine-vs-Irvine substitution effect of SFRs vs Condos. A frequently mentioned benefit of living in Irvine is access to excellent schools and proximity to employment. Unless the Irvine Unified School District utilizes some highly gerrymandered attendance zones, owners of Irvine condos are entitled to receive and same quality of schools as Irvine SFR owners. Rumor also has it that the IUSD allows children from SFRs, condos, and even apartments to sit in the same classrooms as each other. We do indeed hope that SFR parents have that difficult talk with their children about what a “middle unit” is before kids learn the hard way. Oh, the horror! All Irvine residents enjoy the same overall crime rate, proximity to jobs, microclimate and so forth. As a result, Irvine condos are a close substitute for Irvine SFRs, especially given that Irvine contains many larger 3-bedroom condos. A long-term equilibrium will likely either have condo prices rebound, relative to SFR prices – or will have SFR prices decline, relative to condo prices. Falling condo prices mean the move-up market is broken. It isn't until condo prices bottom then come up a bit that buyers have equity to put 20% down on a different property. The move up market doesn't happen by magic. People still need a raise in pay to afford better accommodations because houses all rise in price together in a healthy market. If the low end of the market is moving down, it is robbing the equity of prospective buyers looking to move upward. Condo prices are more volatile than SFR prices because not all the equity from a condo sale is used to push up the next rung on the property ladder. There is always some diffusion as people endure transaction costs, and during the housing bubble, extracted and spent their equity. This makes condo prices rise quicker in a good market; however, since condos are less desirable than SFRs, they also tend to fall faster in a bad market. Jaysen's commentary on the effects of 100% financing are right on. Mortgages take on the characteristics of options, and what started as an affordability program, 100% financing ended up making houses very unaffordable as prices were driven up to the stratosphere. Regardless of which path the market takes, if you are buying as an investment, it makes little sense to buy an Irvine SFR. If you believe in the Gospel of Irvine, and you want to make money purchasing Irvine real estate, you should be buying condos. When the equilibrium is restored — up or down — condos will move positively more than SFRs. If you are interested in Irvine condos as an investment, today's featured property is an opportunity to make money from a desperate seller capitulating to the market. If you want to see what capitulation looks like, examine the price history of this previously featured condo. This home was sold at a foreclosure auction. This property was purchased at auction on 1/27/2010 for $258,000. As all auction purchases are, this one was all cash. It looks as if they had the property in escrow just as the tax credit was expiring in May of 2010, and the property fell out of escrow. As we all know, prices have gone straight down ever since. They relisted the property and chased the double-dip for a full year finally terminating their listing in April. After 16 months of ownership paying the $385 per month association fee, property taxes, insurance, and utilities, the carrying costs finally forced these sellers to give up their denial and lower their price to sell the property. The emotional decision to sell a loser is tough, but once it's made, only then does a seller really get to assess the damage their denial caused. They have lowered their price $40,000 since April 4. That is over 15% of the purchase price, and they still haven't found a buyer. That is a motivated seller. If you're interested, give them a lowball offer. They might surprise you and take it. This entry was posted in Library, News on August 3, 2011 by IrvineRenter. Interesting trend of condos vs SFR. I wonder what the cause of it is? Perhaps people who already had some money and an SFR moving to Irvine to avoid all the school cutbacks elsewhere in OC/LA? Or Asian investors looking for an inflation hedge since SFR is mostly land while condo is mostly aging depreciating structure? It’s going to be interesting to see how the condo vs. SFR price trends move going forward. The hedonic analysis presents a clearer picture of exactly what’s happening in the Irvine market–but does not address the “Why?” question so clearly begged by the numbers. The foreign investor hypothesis is an especially interesting one. Housing’s returns to a US-based investor over the last few years have been poor, as SFR values have fallen nearly everywhere. However, because the dollar has also weakened, the returns to foreign investors are even worse. For foreign buyers in 2006, for example, the home itself is down 20-30% in value, but the foreign investor has also lost 20% in his home currency. At the few-years-ago rate of $1 = Yen100, a $800k Irvine SFR is Yen80M. At today’s rate ($1 = Yen77), and a 20% drop in home values, the Irvine home is now worth $640k or Yen49.28M. That’s a total loss of 38.4% before significant transaction costs. Of course most Japanese have lived real estate deflation (from their own bubble) for 15-20 years and are not as easily fooled this time around. I would speculate that the new “dumb money” is coming from countries that have generated new populations ready to get burned for the first time. I have no data to back up that statement (yet!). For a foreigner who wants an inflation hedge, gold would appear to have both superior returns and superior liquidity. 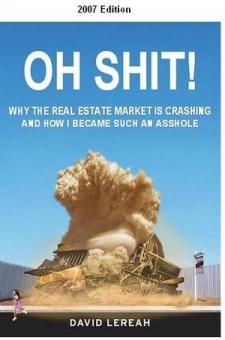 From what I remember about the last So Cal real estate bubble, the foreign buyers were the last in and the worst burned. If the same holds true, there must still be a ways to go on the downside. While this is an analysis of condos vs. SFR in Irvine, it also serves as an excellent overview of the status of the bubble for the greater metropolitan area. Like condos, the relatively less desirable areas such as the Inland Empire and the inner city are off their peek pricing 40-50 percent. More desirable areas such as the South Bay and Irvine are only down 20%. When you look at the area real estate prices from a historical perspective or analyze the fundamentals such as income vs. price, it is clear that it’s the high end that still has a long ways to fall. Hey IR, I just read all ur posts about the OCAr and their accusations against you and free speech, I thought it was very very entertaining…I like the way u write and get the truth out…I don’t have enough time to read all the posts on this blog I may have read about 2% of the total, but I enjoyed these very much, it made me laugh at their lies and/or stupidity at many paragraphs and pictures. I’m glad you enjoyed the drama. It was an entertaining diversion. Thanks for your comments. If you only had training and experience, what you call a turd is really is chocolate and take out a home loan is an excellent investment. The turd is beging sold as chocolate. If you disagree, we will harass you, tell others you don’t know what you are talking about and are slandering our profession. People need to know how do do simple math and live within their means. The market currently feeds on greed. Greed is one of the 7 deadly sins. What are the other marketing tools? Too bad the bay area doesn’t have any “100% financing on our new homes” with 5% cash back for improvements. This might be a dumb question for IR or anyone else out there that can explain. How does IHB calculate the Income Requirement needed to buy a home? From my math on this purchase, an income of $48,156 as compared to purchase price on $229K is a 4.75 ratio. Healthy ratios should be between 3-4x income. ? I know my income somewhat exceeds $48K, but I’d never consider buying a place like this featured for $229K. Seems to burdensome in debt service for what I’d be getting in return, as compared to a comparable rental. To follow up, I know interest rates of 4.53% for a 30yr fixed are at historic lows if you can “qualify”, but I’m still curious how the income “requirement” is calculated. Seems everyone in OC and SoCal in general has an inflated sense of what their income can affordably purchase for their primary shelter. The best way to find out what one is *really* worth is to apply to become a Debtowner. I based the income requirement on the payment with a 28% DTI and backwards calculate the income it would require to make that payment. Based on your query, I just went back and modified the formula to take into account taxes, insurance, HOA and so on and use a 31% DTI. In future posts, the income requirement will reflect current underwriting standards. First, thanks to Jaysen Gillespie of Global Decision and IrvineRenter for providing and presenting these series of very interesting hedonic price model data sets over the last few weeks. When I first moved in during the summer of 1979, virtually every unit was owner occupied with few renters that I am aware of. Now, 32 years later the ratio has changed dramatically, and probably hovers around 50% owner occupied / 50% rental. (Authors comment: My data is based on local neighborhood knowledge and not very scientific). Question for Jaysen and IrvineRenter: Can the current condo faster price drop be correlated with Owner-Ocuppied/rental ratio? One theory I have is that condos dropped faster in price compared to SFR simply because they needed to come closer to rental parity. In other words, any investor who a bought a condo since 2006 as a rental has less purchase price wiggle room compared to a SFR if such an investor expected his rental unit to be cash flow positive. Glad you are enjoying the series of articles. Woodbridge is an interesting case study because it’s a quality area that has withstood the test of time and also has a large number of condos. If the owner/renter ratio is as high as you suspect, I would theorize a number of reasons why this might lower prices more quickly. First, investor-owned units don’t qualify for some of the mortgage modifications and other foreclosure stalling initiatives that exist. Second, investors may be more likely to “walk away” (less emotional tie to the property) if it’s in their interest financially. Third, it’s harder to finance a condo in a complex with a high ratio of investor-owned units. Fourth, association fees are a much larger percentage of the monthly cost of condo ownership (vs SFRs). Association fees are (i) not lowered by record low interest rates and (ii) generally on the rise due to all the squatters/delinquents who are not paying. The remaining good-standing members of the association often pay more to cover the bad debts from defaulters. I’m not an expert on Fannie/Freddie/FHA requirements, but I believe they restrict lending in complexes with too many investor-owned units (if an expert in condo financing is reading this, please correct me). I also personally suspect that condos are looked at as close substitutes to apartment rentals. As a result, the condo prices in Irvine should drop just below the cost-to-rent when we have bottomed. In the last bottom (1996), the cost-to-own for condos was quite a bit below the cost-to-rent. Because condo prices have declines, and rents are flat-to-up, it seems logical that condos will bottom out first (before SFRs), making a condo purchase (in my view) the better choice if your primary criterion is preservation of down payment captial invested. On the move-up market – it is frequently mentioned that with prices declining, the move-up market is no longer working. I disagree and the move-up market was disfunctional during the bubble. Miami had double digit annual appreciation from 2000-2006. You could have started at a 200k home in 2000, and have 40k of equity to put into the next home, say 10% down. $400k home sees 30% total appreciation over the next 2 years, so now you have $160k of equity. Again 10% down, and you’re at $1.6M. Two years later, by the end of 2006, your property is another 40% up and worth $2.25M. Now has this person’s income 10X’d over the period from 2000-2006 to justify the 10X in home price he’s supporting? Declining prices actually help from an affordability standpoint, but hurt equity positions. This should make them a better time to buy than frothy markets. Look at the $200k – $400k home jump. The $400k home was $320k in 2000, and say declined 10%. The $200k home has a loss of $20k, but you’ll pay $32k less for the more expensive home. $12k (about 4%) saved. The high levels of appreciation also fueled rapid moving up. If you’re only going to be in a home for 2 years, you should really be renting (only looking at financials). The high rate of appreciation masked the high transaction costs. I’ll bet in 5 years, the average number of years in a home will be higher than it was 10 years earlier in 2006 (maybe have to factor in for foreclosures). You hit it on the nail why “loanowners” love rising housing cost. Creatation of their downpayment from the great fool. Local govt loves it too. Higher RE tax collections. I don’t think we’ll seen underwritting of 60% DTI very soon. I was going to write in my life-time but people don’t learn from history. It will be different this time…. This is part of why stated-income liar loans and option arms were so important. A $1.4M option arm shaves nearly $4k off your payment vs. a FRM. You could have a payment of $7300/mo. That is $175k. In my world, households with $175k/yr incomes do not buy $1.6M homes with just 10% down (if they’ve got the cash to get the payments down to a manageable level, good for them). I haven’t looked for them and don’t hang out with high-rollers like that, but I imagine if one looked, they could find that scenario. More likely someone who bought in 2000 and moved up in 2006 after a more than doubling. A $200k home in Miami would have gone to $550k for $350k of equity. 20% down on $1.75M !!! Or, perhaps it’s just supply and demand. I think the new irvine construction is mostly condos isn’t it? Is there anything like a SFR on a reasonable sized lot being built mow? It’s a mix… attached condos, detached condos and “SFRs” (it’s in quotes because as you mentioned, the lots are not very big). I thoroughly enjoy Hedonic Wednesdays and hopes this remains a regular feature (I was having withdrawal symptoms last week). > “SFRs” (it’s in quotes because as you mentioned, the lots are not very big). Not very big, but with HoAs and Mello Roos. Yup, smells like condos to me.